Maria Gaetana Agnesi (Italian pronunciation: [maˈriːa ɡaeˈtaːna aɲˈɲeːzi, -eːsi; -ɛːzi]; 16 May 1718 – 9 January 1799) was an Italian mathematician, philosopher, theologian and humanitarian. She was the first woman to write a mathematics handbook and the first woman appointed as a Mathematics Professor at a university. Maria Teresa Agnesi Pinottini, clavicembalist and composer, was her sister. Maria Gaetana Agnesi was born in Milan, to a wealthy and literate family. Her father Pietro Agnesi, a University of Bologna mathematics professor, wanted to elevate his family into the Milanese nobility. In order to achieve his goal, he had married Anna Fortunata Brivio in 1717. Her mother's death provided her the excuse to retire from public life. She took over management of the household. She was one of 21 children. Maria was recognized early on as a child prodigy; she could speak both Italian and French at five years of age. By her eleventh birthday, she had also learned Greek, Hebrew, Spanish, German, and Latin, and was referred to as the "Seven-Tongued Orator". She even educated her younger brothers. When she was nine years old, she composed and delivered an hour-long speech in Latin to some of the most distinguished intellectuals of the day. The subject was women's right to be educated. Agnesi suffered a mysterious illness at the age of 12 that was attributed to her excessive studying and was prescribed vigorous dancing and horseback riding. This treatment did not work; she began to experience extreme convulsions, after which she was encouraged to pursue moderation. By age fourteen, she was studying ballistics and geometry. When she was fifteen, her father began to regularly gather in his house a circle of the most learned men in Bologna, before whom she read and maintained a series of theses on the most abstruse philosophical questions. Records of these meetings are given in Charles de Brosses' Lettres sur l'Italie and in the Propositiones Philosophicae, which her father had published in 1738 as an account of her final performance, where she defended 190 theses. Maria was very shy in nature and did not like these meetings. Her father remarried twice after Maria's mother died, and Maria Agnesi ended up the eldest of 21 children, including her half-siblings. In addition to her performances and lessons, her responsibility was to teach her siblings. This task kept her from her own goal of entering a convent, as she had become strongly religious. Although her father refused to grant this wish, he agreed to let her live from that time on in an almost conventual semi-retirement, avoiding all interactions with society and devoting herself entirely to the study of mathematics. After having read in 1739 the Traité analitique des sections coniques of the Marquis Guillaume de l'Hôpital, she was fully introduced into the field in 1740 by Ramiro Rampinelli, an Olivetan monk who was one of the most notable Italian mathematicians of that time. During that time, Maria studied with him both differential and integral calculus. Fellow philosophers thought she was extremely beautiful, and her family was recognized as one of the wealthiest in Milan. According to Dirk Jan Struik, Agnesi is "the first important woman mathematician since Hypatia (fifth century A.D.)". The most valuable result of her labours was the Instituzioni analitiche ad uso della gioventù italiana, (Analytical Institutions for the Use of Italian Youth) which was published in Milan in 1748 and "was regarded as the best introduction extant to the works of Euler." The goal of this work was, according to Agnesi herself, to give a systematic illustration of the different results and theorems of infinitesimal calculus. The model for her treatise was Le calcul différentiel et intégral dans l’Analyse by Charles René Reyneau. In this treatise, she worked on integrating mathematical analysis with algebra. The first volume treats of the analysis of finite quantities and the second of the analysis of infinitesimals. A French translation of the second volume by P. T. d'Antelmy, with additions by Charles Bossut (1730–1814), was published in Paris in 1775; and Analytical Institutions, an English translation of the whole work by John Colson (1680–1760), the Lucasian Professor of Mathematics at Cambridge, "inspected" by John Hellins, was published in 1801 at the expense of Baron Maseres. The work was dedicated to Empress Maria Theresa, who thanked Agnesi with the gift of a diamond ring, a personal letter, and a diamond and crystal case. Many others praised her work, including Pope Benedict XIV, who wrote her a complimentary letter and sent her a gold wreath and a gold medal. In writing this work, Agnesi was advised and helped by two distinguished mathematicians: her former teacher Ramiro Rampinelli and Jacopo Riccati. The Instituzioni analitiche..., among other things, discussed a curve earlier studied and constructed by Pierre de Fermat and Guido Grandi. 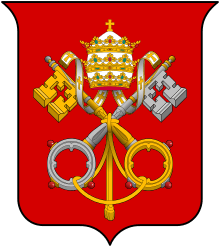 Grandi called the curve versoria in Latin and suggested the term versiera for Italian, possibly as a pun: 'versoria' is a nautical term, "sheet", while versiera/aversiera is "she-devil", "witch", from Latin Adversarius, an alias for "devil" (Adversary of God). For whatever reasons, after translations and publications of the Instituzioni analitiche... the curve has become known as the "Witch of Agnesi". Bust of Maria Gaetana Agnesi in Milan. Agnesi also wrote a commentary on the Traité analytique des sections coniques du marquis de l'Hôpital, which, though highly praised by those who saw it in manuscript, was never published. 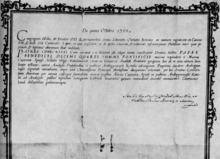 In 1750, on the illness of her father, she was appointed by Pope Benedict XIV to the chair of mathematics and natural philosophy and physics at Bologna, though she never served. She was the second woman ever to be granted professorship at a university, Laura Bassi being the first. In 1751, she became ill again and was told not to study by her doctors. After the death of her father in 1752 she carried out a long-cherished purpose by giving herself to the study of theology, and especially of the Fathers and devoted herself to the poor, homeless, and sick, giving away the gifts she had received and begging for money to continue her work with the poor. In 1783, she founded and became the director of the Opera Pia Trivulzio, a home for Milan's elderly, where she lived as the nuns of the institution did. ↑ Alic, Margaret (1986). Hypatia's Heritage. 124 Shoreditch High Street: The Women's Press. p. 138. ISBN 0-7043-3954-4. ↑ "Maria Gaetana Agnesi". Agnesscott.edu. Retrieved 2014-05-16. ↑ Moar, Eli (2013). "Maria Agnesi and Her "Witch"". Trigonometric Delights. Princeton University Press. pp. 108–111. ISBN 9780691158204. 1 2 3 4 5 6 7 8 9 Ogilvie, Marilyn Bailey (1986). Women in science: antiquity through the nineteenth century : a biographical dictionary with annotated bibliography (3rd print ed.). Cambridge, Mass. : MIT Press. p. 27. ISBN 0-262-15031-X. ↑ Spradley, Joseph (2016). Salem Press Biographical Encyclopedia,. Salem Press – via Ebsco. 1 2 3 Osen, Lynn M. (1974), Women in Mathematics, MIT Press, pp. 40–41 . 1 2 3 4 Gliozzi, Mario. 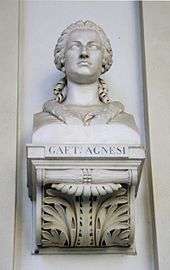 "Agnesi, Maria Gaetana". Dizionario Biografico degli Italiani (in Italian). Enciclopedia Italiana. Retrieved 17 September 2015. Chisholm, Hugh, ed. (1911). 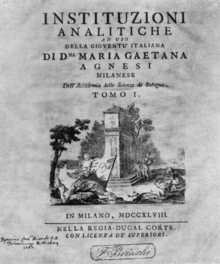 "Agnesi, Maria Gaetana". Encyclopædia Britannica. 1 (11th ed.). Cambridge University Press. Wikimedia Commons has media related to Maria Gaetana Agnesi. Wikisource has the text of the 1911 Encyclopædia Britannica article Agnesi, Maria Gaetana.